Fleas feed on the blood of their hosts, which can be any of a vast number of mammals and birds. 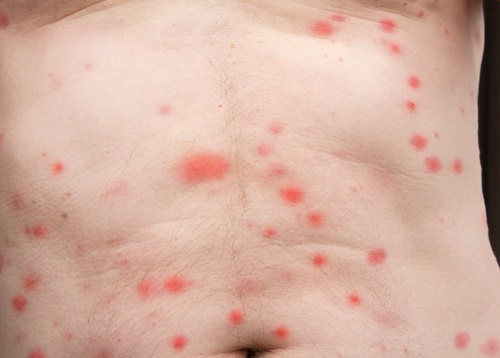 Flea bites (a condition also known as Pulicosis) can be itchy, swell, and be unsightly. Many people and animals are allergic to flea saliva and In addition, fleas are capable of transmitting various serious diseases and parasites. If you suspect you have fleas in the house, it will be useful to be able to recognize the bites and dangers, and to know how to treat them. Due to the small size of fleas, flea bites are generally not painful. They can, however, cause itching which leads to the host scratching the area. This repeated scratching can lead to open sores and infections. People who are allergic to the saliva in flea bites may develop rashes after 48-72 hours. A flea bite generally looks like a small mosquito bite, with a slightly swollen raised red area with a small puncture mark in the center. Bites are often found on the waist, neck, ankles, armpits, and in the insides of elbows and knees. In addition, flea bites are generally found in clusters. In extreme infestations where fleas have been able to draw a serious amount of blood, is it possible for the host to develop anemia. Flea bites in and of themselves are generally not a serious danger. However, fleas can act as transmitters of diseases and parasites that can lead to more serious situations than the bites on their own. Fleas are able to carry dozens of viral and bacterial diseases as well as parasites, and are though to have helped introduce the bubonic plague to humans by transferring it to them from rodents. For this reason, if you begin to show symptoms beyond a moderate rash, you should seek medical attention. It had at one point of time been suggested that flea bites can be linked to impotence. Medical evidence for this is largely lacking and most of the origin of this hypothesis can be traced back to a court case in which two men attempted to sue a hotel and a travel website because one of them purportedly became impotent following rashes he contracted from flea bites while staying at said hotel. Do not scratch the bites. Scratching flea bites makes them more itchy, can cause blisters, and can lead to infection. Take an antihistamine (a pill against allergies), which will help stop any allergic reaction you may have to flea saliva. If you are allergic, this will stop hives, rashes, swelling, and some of the itchiness associated with flea bites. Scrub the area where you were bitten with soap and a washcloth. This will help remove excess dirt and bacteria and will help you avoid infection. Apply hydrocortisone or calamine lotion to bites. 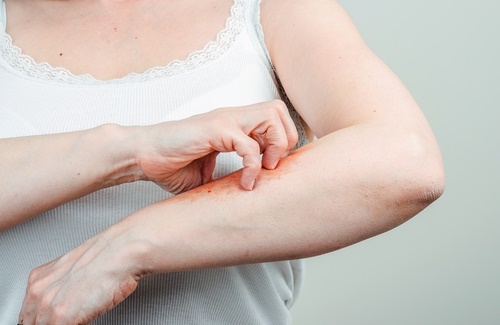 Hydrocortisone can be found in any local pharmacy and will help to reduce itching. Apply ice to bites to help reduce swelling. If you develop symptoms besides itchiness and mild rashes, you may want to consider seeking medical advice.